Gina Little is from Pictou County, Nova Scotia. She is a technologist with the Meteorological Service of Canada (MSC). Gina joined the MSC’s Sable Island team in February 2007, and during the past eleven years has spent six to seven months annually on the island – a total of about 70 months thus far. After receiving a BSc at Mount Allison University (Sackville, New Brunswick), Gina travelled to Kenya for a 10-week field studies program under Langara College (Vancouver, British Columbia)—her courses included entomology, herpetology and marine biology. This was followed by two years studying Environmental Technology (chemistry, biology, environmental legislation) at Centennial College (Scarborough, Ontario). Prior to joining MSC, Gina worked in the field of food safety as a HACCP coordinator (Hazard Analysis & Critical Control Points). Once accepted into the MSC program, Gina was trained in upper air at Stony Plain, and after arriving on Sable Island—on March 21st, spring equinox—she was trained in surface weather by Gerry Forbes, then the station’s Officer-in-charge. Gina does two three-month tours per year on the island, and between Sable tours she travels. Gina began with Egypt and Jordan in 2009, and since then has visited 40 countries. Gina tends to avoid frosty destinations. When not on Sable Island or travelling, she performs in parades and concerts with the Pictou County Pipes & Drums. In spring 2017, Gina began helping Zoe with organizing the Sable Island Alumni Sand Collection (inaugurated in 1988, in the Mohave Desert). Gina’s MSC colleague Mike suggested that her position title should be “Global Director of Fine Grain Procurement and Logistics” (GDFGPL). While on the island, Gina uses some of her time off between work shifts to walk. In her Sable Island Photoblog, Gina shares a few of the many patterns, small details, and scenes that catch her attention as she hikes along. 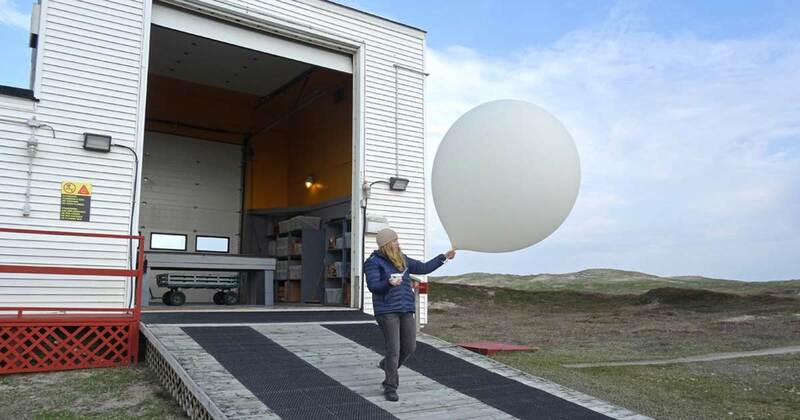 During her time working on Sable Island, Gina has launched more than 2000 weather balloons. Each hydrogen-filled balloon carries a radiosonde, an instrument package that measures wind speed and direction, temperature, pressure, and relative humidity as it rises through the atmosphere. 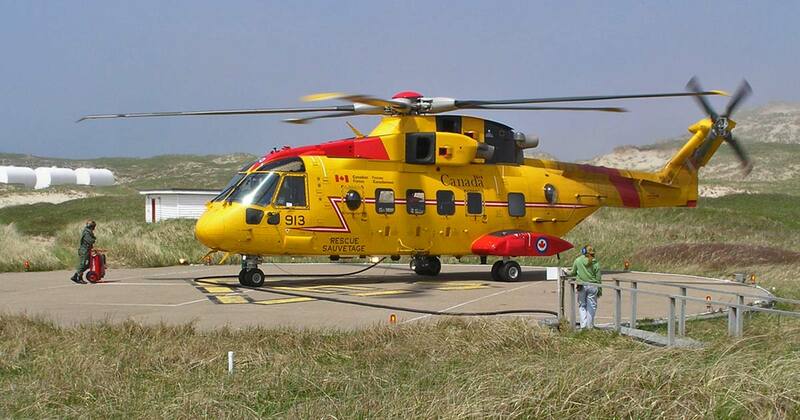 Prior to Parks Canada taking over operations on the island in 2013, the Meteorological Service of Canada owned and managed the Sable Island Station and provided support for other agencies and programs. In addition to their met service duties, the MSC personnel assisted with a wide range of other operations. During 2008, while a Search and Rescue helicopter (a CH-149 Cormorant) refuels on the helipad, Gina keeps an eye on the fuel line and stands by the emergency fuel shut-off switch. Marielle Thillet is the Senior Environmental Specialist at Deep Panuke, Encana Corporation’s natural gas field located in Nova Scotia’s offshore, and about 50 km southwest of Sable Island. In her role, she is an integral part of the Deep Panuke team charged with monitoring environmental performance both offshore and onshore at pipeline landfall in Guysborough County. A Professional Engineer, she is a graduate of the Engineering School of Marseille, France, and received a Master of Science in Marine Technology from Cranfield University, UK. She also holds certificates in Canadian Risk Management and Environmental Management from Dalhousie University and is a certified Project Management Professional. Marielle was lucky enough to travel to Sable Island on three separate occasions: an overnight trip for an environmental inspection in September 2010; three landings with the Adventure Canada Sable Island voyage (as a guest staff) in June 2014; and (her favourite) a nine-day trip to monitor the Ipswich Sparrow, a species which nests exclusively on the island, with a research team from Acadia University (a research project co-funded by Encana) in August 2012. Passionate about the outdoors, Marielle left her natal France to explore Canada in 2000 and has not looked back since. She commits time to the Nature Trust of Nova Scotia and is an avid hiker, paddler and Ultimate Frisbee player. She has travelled across Canada, trekking in national parks in Newfoundland and Labrador, Quebec, Alberta and the Yukon. She lives in Dartmouth, Nova Scotia, with her husband Vincent and their two young children. One of the Institute’s goals for the Sable Island Bibliography is to provide translations of the annotations (summaries, abstracts, reviews, and commentaries) provided for titles listed. In spring 2019 the Institute will seek funding to support this project, but in the meantime, Marielle has volunteered to make a start by translating summaries of some scientific papers reporting the results of bird research on Sable Island. 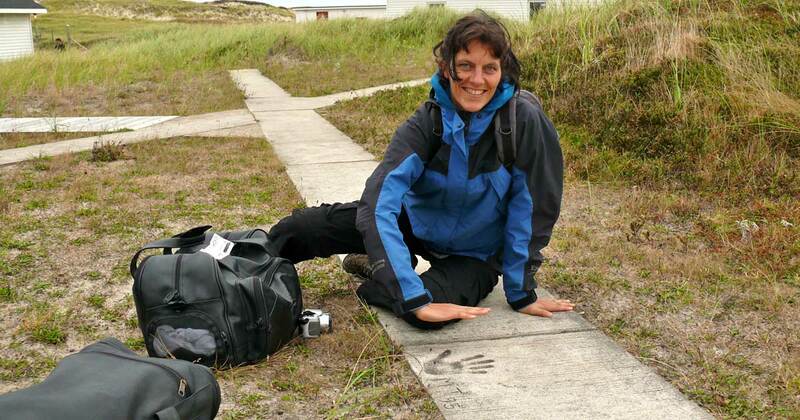 During her overnight visit in September 2010, Marielle noticed her initials “MT” written in the concrete of a walkway at the Sable Island Station. The hand print was a perfect match for her own. However, those initials and handprint had been pressed into the wet concrete 15 years earlier, in summer 1995 when the concrete was poured by MSC personnel. In 1995 Marielle was in France, working as a counselor in kids’ summer camps. Marielle holding an Ipswich Sparrow which had been captured to be weighed, measured and banded during a research project with Acadia University in August 2012. The data collected was used in a study of the fall migratory routes of adult and juvenile Ipswich Sparrows (Crysler et al., 2016).